Some of you might know about my recently acquired cat - Honey Delite. She's very fluffy! It's also taken several weeks for her to gain our trust. She's a cat that I helped my father adopt for his barn, so she wasn't very friendly at first. Now that we've earned her trust, I've been able to brush her a little bit. I was starting to get worried about her long fur because I noticed that it was matting a bit in a few areas. That's one of the main reasons why it's good to brush your cat. It's important that cats get regular grooming mostly in the form of brushing. Some cats love to be brushed, and some don't. Starting at a young age can help a cat get used to being brushed. Of course, that's not always possible just like in my situation. Honey Delite was adopted when she was about 7 years old and I have no idea if she was brushed in her previous life. Even if your older cat doesn't like to be brushed, it's still good to try and get them used to being brushed. Anyways, I've put together this list of reasons why it's good to brush your cat in hopes that more cat parents will understand the importance of it. Proper grooming for your cat is a must! Brushing prevents mats. As already mentioned above, this is one of the most important reasons why you should brush your cat on a regular basis. 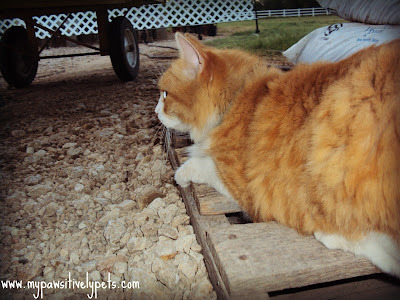 Mats can be very uncomfortable and even painful for cats. Sometimes, the only way to remove mats is by shaving them off. Never try to remove mats with scissors! Reduces shedding. Brushing your cat helps reduce shedding some by removing excess fur. Instead of the cat shedding on your furniture, the fur is removed by a brush. Helps keep your cat clean. Cats are pretty good about cleaning themselves but everyone needs a little help every now and then. Brushing can help to remove excess dirt and debris and keep your cat's skin cleaner. Brushing helps you bond with each other. Since most cats enjoy being brushed, this is a great time to bond with your feline friend. Some cats really enjoy the way it feels too. Helps spread natural oils over your cat's skin and coat. Brushing your cat will help spread the oils that their skin produces. These oils are responsible for keeping your cat's coat shiny and free of irritants. Brushing could help lessen hairballs. Some cats have problems with hairballs, especially ones with long fur. Regular brushing can help reduce hairballs in your cat. A cat with long fur will need to be brushed more often than a cat with short fur. Long-haired cats should probably be brushed on a daily basis, while short-haired cats may only need to be brushed on a weekly basis. As far as bathing goes, it's usually not necessary. If you'd like to know more about bathing your cat, I have written a post about it in the past that you can read - Does Your Cat Need a Bath? There are tons of cat brushes to chose from but one of the most popular cat brushes is the FURminator. (Clicking the affiliate link will take you to Amazon where you can purchase one.) Find a brush that your cat likes and gets the job done. Does your cat enjoy being brushed? If you have any tips or tricks for brushing your cat, I'd love to hear them in the comment section! We agree with Easy. Have a marvellous Monday. my nanny's cat hates being brushed so she gets bribed with treats - oh to be a cat! My kitties are mostly ok with being brushed. We do have a FURminator brush and they really are amazing at removing excess hair. And yes it is especially important to help with hair ball control. Now if only there was an easy way to get the kitties to agree to having their nails trimmed! Cody absolutely LOVES LOVES LOVES his Furminator. He will jump on top of his cat tower that is in our "office" and roll over waiting to be furminated. It is too cute! All except the last one are good reasons to brush your dog too. I'd imagine that at least some cats appreciate the massaging feeling of being brushed. I'm glad you were able to gain the trust of Honey Delite. Hopefully brushing will be a wonderful time you two share together. Very true Pamela! Thanks for stopping by - I hope I'm able to bond with Honey D. a little more too. My old tomcat LOVED to be brushed. I'd brush, he'd squirm. I'd brush, he'd kick with his back legs. Was totally a game! I so miss him! I love, love, love the brush, any time, any place! Well that's great Brian! I just read about your sister who doesn't care for the brush too much hehe. Yep! That's very true. I've met some bunnies who like to shed A LOT! we all loves a grate brushin...we likez R kong zoom groom coz itz kinda like a brushin N cat maysage all at once !!! I'm glad you kitties like your brushes! I don't think I've ever seen one of those brushes before. Aw I didn't know you had a kitty! I love love love my FURminator! When I won one, I thought it would give me another opportunity to bite the peeps. So far that hasn't happened. FURminators are better than regular brushes because they get the undercoat, whichis very important. Regular brushing don't. I used to jump on my Tree of Pain to be FURminated but now that they gave it away, there's really no good spot to brush me. On another note, TW used to have a stray angora living under her porch. Her fur got so matted, it actually peeled away from her skin. TW had been reluctant to do anything since the cat was supposed to belong to a neighbor but after that happened, she called her friend who worked for a shelter and they took the cat away. It was shaved and eventually adopted by someone who would take better care of her. Well, definitely don't cut them with scissors. There is a special way to do it and it's very easy to cut them. Sorry Alf! I really need to brush my kitty but she hates it. I got her as an adult, so I am guessing it is not something she had as a kitty. She will let me clip her nails, but not brush her. Go figure. Oh no lol... that is so weird! Our cats get the brushing 1-2 times a week. They both handle it pretty well and we don't have many issues with hairballs because of it. What's strange is that my long hair cat sheds way less than my short hair cat. I'm blown away by the amount of hair that comes off of my tuxedo. It's nuts. But I brush him every other day and they both love it. Once I started following a regular schedule, I did notice that the hairballs decreased. I wonder why that is? I haven't really had many longhair cats of my own. Honey Delite is probably the first really. Maybe we had one when I was a kid. Glad the hairballs started to decrease with the brushing. The causes of moist hairballs are pretty simple: Cats are very clean animals that love to groom themselves. Most hair will pass through the intestinal tract into the stool. A hairball forms when too much hair accumulates in the stomach and has to be expelled.